Do you feel like battery life has worsened since updating a Mac laptop to MacOS Mojave? 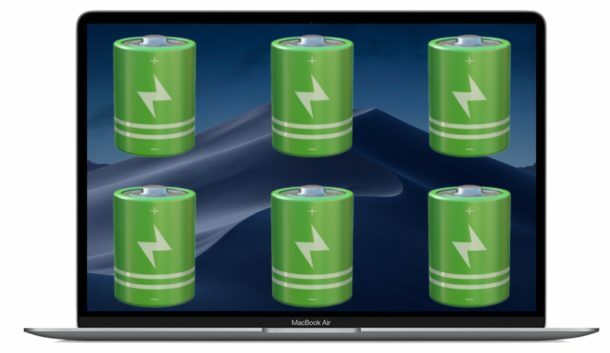 Some Mac users have discovered their battery life has reduced after updating a MacBook, MacBook Pro, or MacBook Air to MacOS Mojave 10.14.x, or just that battery life seems to drain faster than expected. Here we will discuss a few possible reasons for reductions in battery life, as well as offer some helpful tips to improve battery life on Mac laptops running MacOS Mojave. If you just recently updated a MacBook Pro, MacBook Air, or MacBook to MacOS Mojave, and now you feel like the laptop battery is draining much faster than usual, then you might be right… your battery life could be worse than usual, at least for the time being. This is usually because MacOS runs a variety of background activities and tasks for everything from indexing Spotlight, indexing Photos, to managing and syncing iCloud data, to various other background tasks. The effect of this system activity is potentially a temporary reduction in battery life or even reduced system performance as the background processes complete themselves. The solution to this is quite simple, and requires nothing more than some patience. Just wait until all there background activity completes. Leave your Mac laptop plugged into a power outlet and turned on for a while (leaving it on overnight when it’s not in general use can be helpful for this, just be sure to use a screen saver or turn the display off) and just let MacOS complete the necessary background chores. After a day or two these background tasks should be completed, and Mac performance and MacBook battery life should return back to normal. Remember you can always check to see how much time a Mac battery is expected to last based on current activity and the current charge by looking in the Energy section of Activity Monitor. This can help to be a reference point for knowing what your current battery life is, as well as seeing how it may change based on various adjustments made using the tips below. Some Mac laptop users may have Energy Saver settings configured in such a way that is not optimal for battery life. 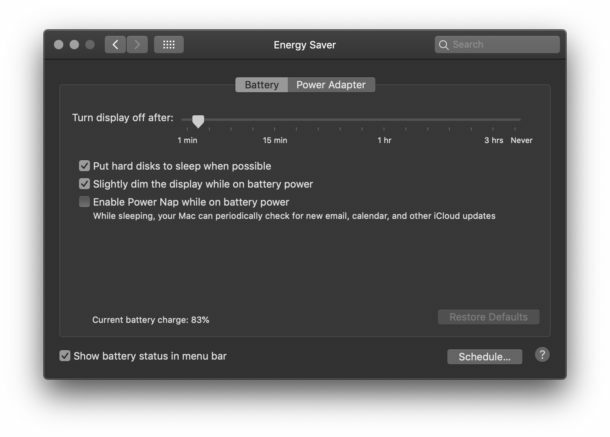 Some MacBook Pro users have noticed that Power Nap was turned on for battery power, which can theoretically lead to increased battery draining when a Mac laptop is in sleep mode, since it allows for some limited system activity even when a computer is sleeping. Power Nap is fine for using with a Power Adapter, but on Battery power it’s best to leave that setting off. 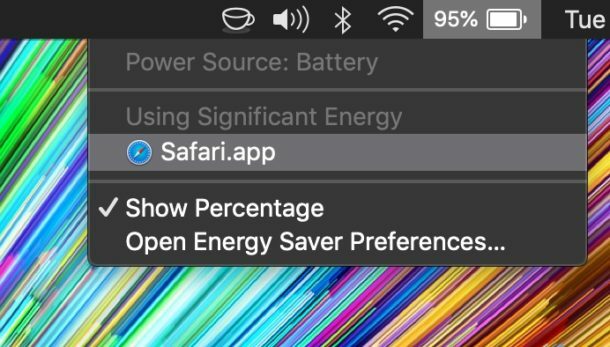 You can see what Mac apps are using battery energy quickly by using the battery menu. If you see something in the list that is drawing significant power and you’re not using the app, quit it, or address the behavior that is causing notable energy consumption. Pay attention for what apps and processes are running and potentially using energy, though note that many system specific tasks or processes may simply need to complete their task before they no longer consume notable energy resources (for example, if you recently updated system software, or rebooted a Mac, or are actively running Time Machine in the background for system backups, etc, you will likely see processes related to those activities). Reducing screen brightness can lead to a dramatic improvement to battery life on any electronic devices, Mac laptops included. 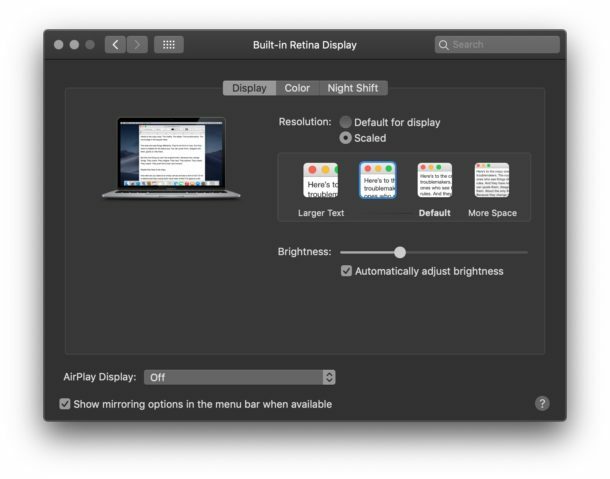 Whether it’s a MacBook Pro, MacBook Air, or MacBook, you can improve battery life by reducing screen brightness. Lower the brightness to whatever is tolerable to your usage situation, obviously if you’re in a dimmer lit area then having a low screen brightness is more acceptable than in a bright room, so use discretion. You can adjust screen brightness from the keyboard (or Touch Bar), or from the Display preference panel. 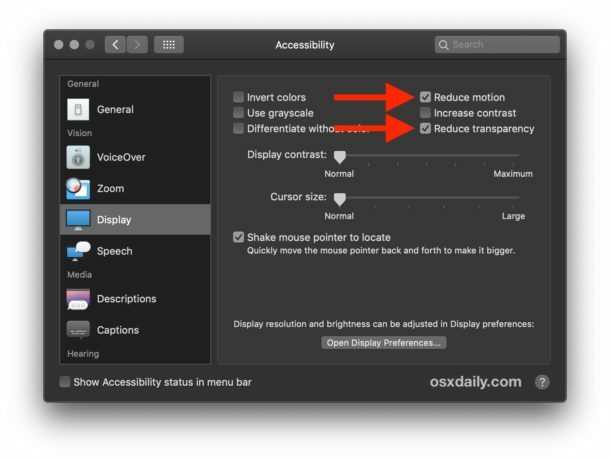 Some Mac users may notice that turning on Reduce Motion and Reduce Transparency can speed up their computer a bit too, particularly on older machines, or if you frequently have many windows open. And of course some people just prefer the way that things look and function with these features turned off as well, so even if you don’t discover any performance change you may appreciate the customization anyway. How has your battery life been with MacOS Mojave? Does your MacBook, MacBook Pro, or MacBook Air have better or worse battery life since updating to MacOS 10.14? Did the above tips help to resolve any battery drain issues you may have been having? 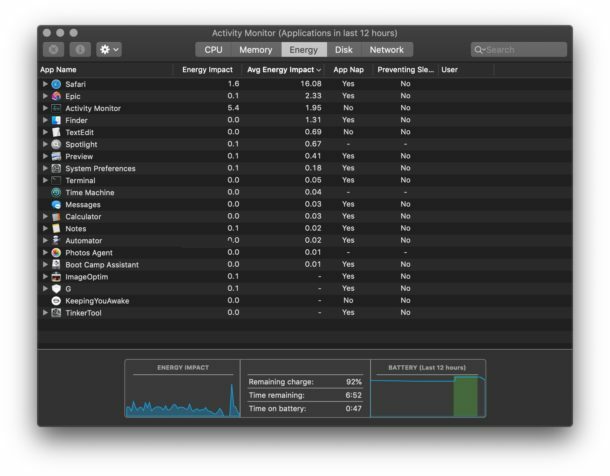 Share with us your experiences with battery life and troubleshooting in MacOS Mojave by leaving a comment below. All good tips, especially disabling Power Nap. Another thing would be to disable screensavers, and go to screen sleep immediately instead. (2) Buy Turbo Boost Switcher Pro and disable Turbo Boost. (3) Install CPUSetter and disable Hyper Threading, which will set the number of logical CPUs to the same number as the physical CPUs, i.e. 4 (or 6 on the i9). With those tweaks I’m getting 10 to 11 hours battery life on my 2018 MacBook Pro, more than Apple is promising, but only with standard work like Twitter, surfing, email, word processing; but even with movie playback etc. or other slightly heavier tasks than normal it’s still around 8 to 10 hours. And do not use Chrome. I’ve seen a good 2 hours less when using Chrome versus Safari. With Safari I can get a good 9-10 hours of use on a single charge and this is on a Late 2013 MacBook Pro Retina. Since I upgraded my iPad Pro, the iPad will not speak to my Epson projector , when I use hdmi with the lightning connection. Is this common ? Patrick, if you have your iPad Pro or Epson Projector connected to the Mac laptop it might drain the battery faster, but that shouldn’t relate to MacOS Mojave or iOS software updates. External perhiphreals and accessories will draw power from the Mac in many cases so disconnect those to prolong the Mac battery life. If your Mac is draining after the update its a bug that apple is not admitting. To disable this just use (this will revert everything back to normal. Otherwise macOS will wake from hibernation, too. That will start draining your battery again, and if you’ve set to destroy your FileVault keys during hibernation, it can also cause kernel panics, maybe even (depending on your regular sleep settings) make your MBP run at 99 degrees Celsius for hours etc. with the lid closed, because macOS needs you to input the FileVault password, which obviously doesn’t work if your afc or the lid is closed. If they are 0, your computer will go from regular sleep to safe sleep (hibernation) immediately, and that’s a bit annoying if you accidentally put your Mac to sleep, or if your Mac went to sleep, and you didn’t want that. I’ve set mine to 30 seconds, but 10 seconds are OK too, I guess. Patience is the solution?! Thats silly. My battery drains while powered off! I shut down my laptop at 100% around noon and power it back up at 8am next day (20 hrs later) and its down to 74%. How is patience going to help that? That’s super-weird. Shouldn’t happen. OK, if there’s a secret chip that draws a little bit of power sometimes, even if the Mac is shut down (the T2? but why? ), then you would maybe lose (at the very most) 1% of battery power per week. Even if you (hypothetically) added an independent internal GPS chip, connected to the MBP power rails, it wouldn’t drain this much power over the course of a day. So maybe there’s a calibration issue, or a software bug? I’d contact Apple about this. I think it’s a problem with the MacBook Airs. My mom and I both have early 2015s (mine is at least a year older than hers) and both are just going dark (shutting down) when battery is below 50%. My kids have both older and newer MacBook Pros and are not having this issue. It started happening after the Mojave update. We both took ours into Apple (in different states) and they said we needed a battery replacement. Remember the battery issue with the iPhones after an update. Last January Apple admitted to a problem and offered a new battery for those iPhones affected for a reduced price of $29 through the end of this year. I have a feeling this is a similar issue. Mine is a 2013 MacBook Air and it does have a brand new battery. My battery is only 1 week old as of writing this. It is on Mojave also and has been since it was released. I have been doing some full stopwatch recorded tests of my ‘uptime’ using the battery and the longest I got was 6 hours of uptime. That includes 170 mins of YouTube videos and browsing also. (these tests do not count the time it is asleep but still on battery power). I have yet to bother doing a test whereby I do not load up YouTube, as why would I? This is what I use it for so no point trying to pretend I am not going to view any videos. I believe Mojave is doing the battery draining the most. With a new battery from Apple, I believe I should be getting longer than 6 hours from the battery.